Whilst Water-Gates are regularly used for flood control, they can also be used to control fire water runoff. Use the weight of water to hold it back! Depending on the model, the weight exerted by the water is up to four times more in the vertical than horizontal, thus ensuring the security of the barrier on the ground. 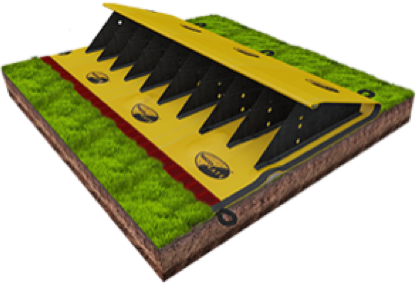 It has been designed and tested to work on surfaces including gravel, grass, asphalt, etc. Create a containment dam in record time, wherever you need. The WL Water-Gate barrier can be used on land to control or divert fire water runoff. The barrier can effectively divert, contain or control polluted water or chemical spills. The barrier can be used to divert foul water away from a watercourse. The WL model is our most popular water barrier. It is very hardwearing and designed for regular use with fast deployment. It has built in weights along the leading edge as ballast, and once rolled out is ready for use. 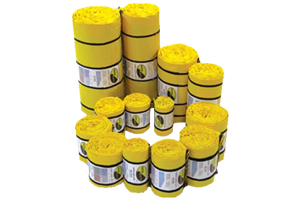 The WL barrier is used by Councils, Water Companies, the Environment Agency, residents and anyone with infrastructure to protect. Durability – The Water-Gate barrier is reusable and can be cleaned to avoid cross contamination. The estimated longevity of the product can be over 20 years when used occasionally and/or for short periods of time. Brand your barriers – Thanks to Megasecur International’s continual investment, we now have the ability to brand customers’ barriers with company logos. Please contact us for a quote for this. Singular barriers come in a roll for easy storage and quick deployment. Barriers can be supplied pre-joined for rapid deployment of long lengths, in made to measure boxes. Depending on the size, the boxes can be supplied on wheels, or moved by forklift, pallet truck or trailer.